(Vancouver, BC) – A celebrated high-note of the Pacific North West’s annual fishing calendar, Chef David Hawksworth returns with a collection of talented companions for his fourth annual Culinary Weekend, held at The Clubhouse on Langara Island. 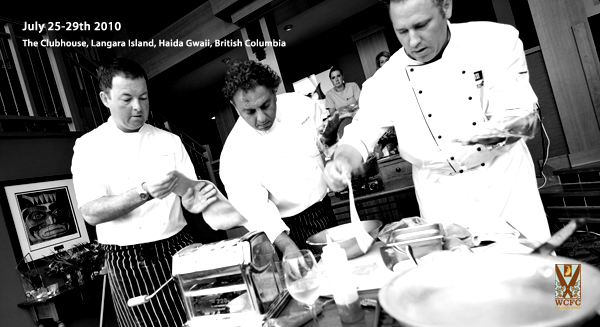 On July 25-29th, Chef Hawksworth, who is soon to open the eagerly anticipated Hawksworth Restaurant at the Rosewood Hotel Georgia, will be joined by a gastronomic powerhouse of chefs and wine experts: Chef Vikram Vij (Vijs and Rangoli); Chef Dino Renaerts (Fraîche Restaurant); Mark Davidson (Sommelier and Wine Educator); and Scott Oliver (Select Wine Merchants). The group will provide food and wine seminars, cooking classes and of course delectable guest chef dinners all set to the dramatic backdrop of the pristine wilderness surrounding the Clubhouse. Resident Chef Chef Ryan Stone, who is eagerly preparing to represent Canada at the 2011 Bocuse d’Or leads a strong kitchen team at the Clubhouse who are excited to welcome a talented roster of chefs during the 2010 season. This year’s Guest Chef Series includes the return of Vancouver’s ‘Chef of the Year’ Chef Robert Belcham of Refuel and Campagnolo along with Chef Don Letendre of celebrated French bistro, Elixir. Chef Andrea Carlson of Vancouver’s revered dining institution Bishop’s and Chef Neil Taylor of Cibo Trattoria, recently named Canada’s Best New Restaurant by Enroute Magazine, will make their Clubhouse debut. Offering guests the ultimate luxury wilderness experience, the West Coast Fishing Club brings added value to fishing trips, through its dedication to showcasing British Columbia’s local ingredients and chefs. Guests are charged no additional costs to enjoy the talents of notable culinary masters, as well as the best salmon fishing on the coast. Culinary fishing trips are available throughout the season, from $5,570 per person, which includes accommodation, all meals, transfers from YVR South Terminal, fishing equipment with an experienced guide and cooking demos. Space is still available for the July 25-29 Hawksworth & Friends Culinary Weekend. For more information call toll-free 1-888-432-6666 or visit www.westcoastfishingclub.com.